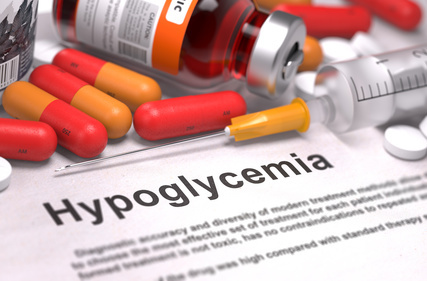 Low blood sugar, clinical name hypoglycemia, is a condition in which blood sugar levels in the body fall too low. Generally, a blood sugar level between 80 and 110 milligrams per deciliter is considered to be in normal range. When this level falls below 80, individuals may develop symptoms of low blood sugar. This condition often occurs in people with diabetes, when they try to control high glucose levels and the level falls too low. However, low blood sugar can occur from other causes, such as going for long periods without eating, from certain medications and from specific medical conditions. Individuals who have been diagnosed with diabetes learn to monitor their blood sugar levels closely. When blood sugar drops below normal levels, they learn to recognize the signs, such as dizziness or nausea. Diabetics often have a glucometer to determine if low blood sugar is the cause. Test strips can also determine if blood sugar levels have dropped too low. They can then take measures to raise their blood sugar to a normal range. If you are diabetic and have frequent bouts of low blood sugar, talk to your physician about changing your medication. If you are not diabetic, adjust your schedule to ensure that you eat on time and see your doctor for a thorough physical to rule out any illness that may be causing the problem.